There have been numerous times over the past few years where I have put my legs to the test. Beach2Battleship 70.3, Rock'n'Roll Las Vegas Marathon, and the Chicago Marathon (to name a few). 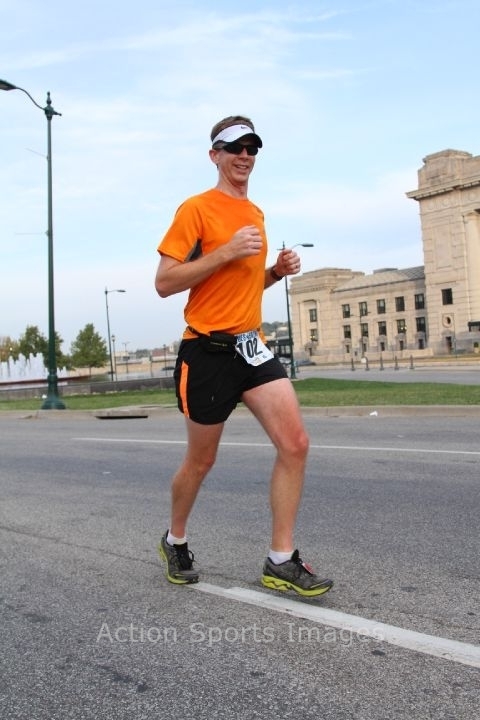 During these events I have noticed my calf muscles are what hurt the most during the later stages of the race. Most recently, I've had some lingering effects with both of my calf muscles after Chicago. In fact, I have yet to wake up in the morning without my calf muscles hating me. They feel tight during the first few steps of the day but eventually there is a lingering pain throughout the day. 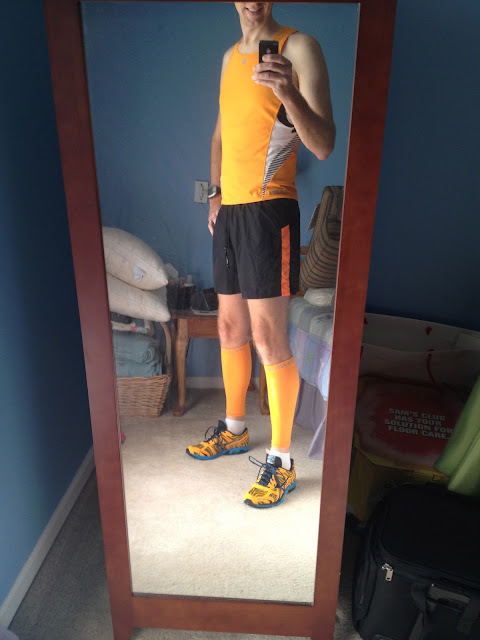 I have compression socks that extend up to my knee cap and I pretty much always wear them after a long run. The compression does feel good but I want to be even a little more proactive. I decided to invest in a pair of Zensah calf sleeves. These look like leg warmers but have a nice level of compression to improve blood flow and aid in recovery. If you look at my last post, you can see me wearing them. My first run with them did not go very well. It was 80 degrees and humid. While they are suppose to have breathable fabric to wear in the heat, I just wasn't used to them at all. A planned 12 mile run probably wasn't the best 'break in' run. In fact, it turned into an 11 mile run. With all that, my calf muscles felt the best they had in 2.5 weeks this morning. They weren't 100% but definitely better. I wore them again on tonight's run and I had my 2nd best 6 mile run ever at 7:32 pace. My best 6 miler was at 7:16 pace; however, tonight's run included 700+ feet of elevation gain. The 7:16 run had 25. TKB and I went to the KC Marathon expo. I actually went with the expectation of buying the calf sleeves at an expo discounted price. Not only did they not have the Zensah line, there was no discount with the brand that was for sale (granted, I didn't look at every booth). Let's be honest here, all they had for sale were lame black and white colors. So I eventually walked around and found the Mizuno rep. My 2nd order of business was buying running shoes because I was over 500 miles on the current pair. Once I hit 400 I start looking for a new pair. I always buy the Mizuno Inspire line. This shoe is a stability shoe because of a pronation "problem" I have with my running style. I ended up talking to the Mizuno rep who showed me a line of lightweight shoes. 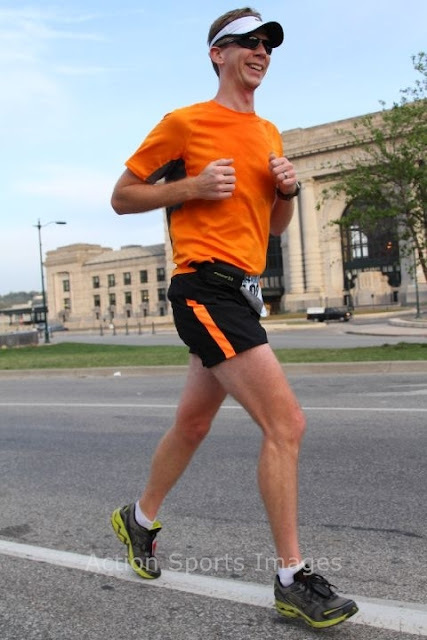 I've been interested in trying running flats as I've started to land more on my mid- to fore-foot (at least at the start of my training runs and races). "Flats" have much less of a heal so it helps force you to land closer to the front of your foot, which is suppose to be a more efficient running style. When you land on your heal, it creates a breaking action that your legs have to overcome. She showed me the Mizuno Elixir 7 shoe. While not a true running flat, it's definitely lighter. 9.3 ounces for the Elixir and 10.9 for the Inspires or about 14% lighter. It definitely has a smaller heal rise as well and probably not as much stability support but enough to not be considered a "neutral" shoe. Speaking of adding the shoes to my rotation, this is the first time I've had two pairs of shoes at the same time. This means I need to start tracking the miles better for each shoe. Normally I just remember the day I switched a use my training logs to add it up. Luckily, dailymile has an easy way to tag equipment in your log entries. About the time this post is published, Joe VI and I will be kicking it up down mile 1 of the Chicago Marathon. Ben is on our heels in a later corral. As I've mentioned in the past, the goal for this race was to Boston Qualify. I also told you recently that I've reset my goal to a major personal best instead. Well, after the events of last weekend and seeing that I can manage 10 miles at a 7:24 pace comfortably (granted, I've probably mentally blocked out any pain I experienced), I realized that maybe training has gone better than expected. I also realized that the whole purpose of this race was to BQ (Boston Qualify). If I go out there and completely explode, then so be it. If I DNF (Do Not Finish), then I will know that I tried. If I get a PW (Personal Worst), then I will know to work harder next time. My training this week has been focused on 1 thing: the first 3 miles of the race. The pacers in Chicago are doing even pacing, which means they will be charging out the gate at 7:14 pace. So on Tuesday, I did just that. It was challenging but within the first half mile my heart rate went from 130 to 179 back down to 150. First mile was at an average HR of 158 and second at 160. I finished those three miles in 7:08 pace. On Wednesday I ran 3 miles starting at 8:00 for the first and 7:45 for the second. I decided at the third to take it easy and enjoy the last miles on my feet and slowed it down to a comfortable pace. But my HR for mile 1 was 150 and 153 for the second mile. Miles 23 - 26.2: Secure a BQ bid. I will really need to hit about a 3:08 marathon to get selected for the Boston Marathon. The idea is that I will still have mental powers for this simple tracking plan for the first 6 miles. I will also have the Virtual Partner on my watch set at a 7:14 pace so I will know how far back I am. There was a Q&A question in the Runner's World that I received yesterday. It was how much can you deviate from a pace and still be able to finish the race in that time. In other words, if I slow down will I still be able to speed up to still reach that overall pace. The answer was 5% difference. So if I'm trying to run a 7:14 pace, I should try to stay within 21 seconds of that ((7* 60 + 14) *.05 = 21 seconds). Besides my first mile, I will be within that the entire time. This might be a bunch of hooey, but I'll take anything that qualifies my ill-conceived plan. This is going to be just as much a mental game as physical. This is my third marathon, so I'm hoping that will help me push through miles 20 - 26.2! How about 'dem apples. No seriously... you can almost see them. Thank you, ASI, for unknowingly allowing me to post these images. Great shirt and sweet medal. It doubles as a bottle opener!! Great course and I love going through the 18th and Vine district. Parking was surprisingly OK considering the start location but I think that's an indicator of the number of participants. Great post-race concert headliner band; however, I did not stay for the Blues Traveler because I really wanted to get some food in me that I didn't have to pay for (oops, a little early... see below). The Marching Cobras and the opening act were great. Speaking of Blues Traveler concert. It was free for participants but others had to pay $20 to get in. There was NO policing of the entrance/exit. For one thing, the concert should be free for EVERYONE (although I understand the desire to keep out random people from getting in) but to charge people and not police it? Bad ju-ju. The map indicated 6 bands on the course. There were NONE. Maybe a boom box but definitely no bands. The start line was just a timing mat. There was no banner or structure. For an event planning for 8,000 participants (4,000 10 milers, 2,000 5K runners, and 1,000 teams at 2 runners each) you'd think they'd have plans for one. Other than a bottle of Gatorade, NO post-race food. Even small races will have some sort of fruit waiting for you but they had NOTHING. Seriously? Thank goodness they didn't have the 8,000 runners or else they might have a riot on their hands. Ok, that might be a bit of an exaggeration but this MUST be fixed for next year. Luckily I had cash easily available or I would been having some issues. I was starting to get shaky when I finally gave in and paid $5.50 for an egg sandwich. NOTE: I heard on the Twitter that they ran out of Gatorade. The race website said: "The party starts at 7:00 a.m., and kegs of cold, refreshing beer will help you celebrate crossing the finish line." Provided you bring $$$ to pay for it. Much of the site is misleading like this. The cheapest price for this race was $40 and I got in at that rate. Had I paid $80 for it I would have been extremely frustrated. I've paid $20 - $25 for races that had more amenities than this race. I get that they may have had a budget issue because there were only 1,200 finishers (so maybe 1,300 - 1,400 registered participants?) but that's not an excuse to not having post-race food. I wonder if Grinders put some pressure on them to not have food, but that's even worse. I sure hope that's not the case because I do enjoy going to Grinders and don't want to ruin that experience. United Multisport... shame on you! So... the Official Race photos... Well, it's been 5 days and they still have not posted them. Based on the previous record, I'm not holding out much longer.